Owning a cat is an exercise in patience. Today I got a cat. Her name is Milo. How can something so sweet and disarming climb my curtains, chew on my laptop cord and knock over my most expensive china tea pot in one fell swoop and still look cute doing it. So, yeah, I adopted a cat today. My friends Patrick and Mia rescued this kitten from the streets where her mother had abandoned her, and have kept her for the past several months. 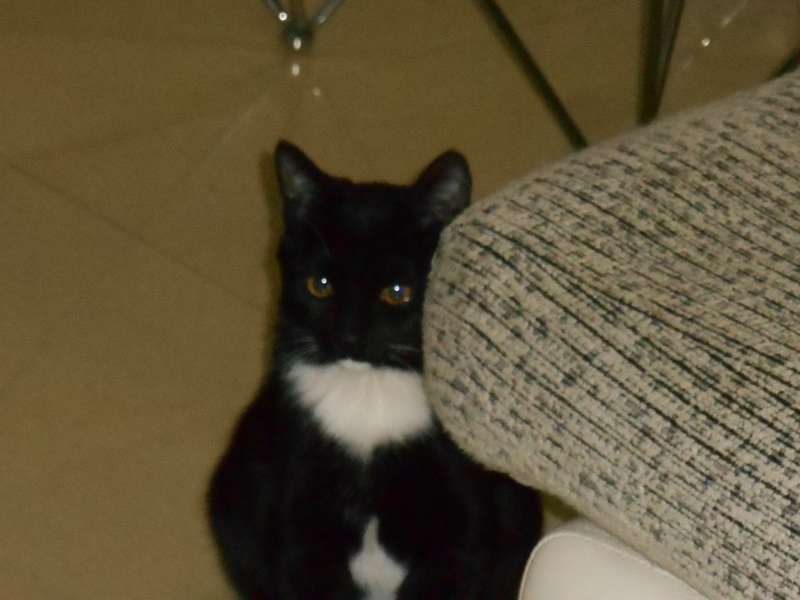 They have been looking for someone to adopt Milo… and that someone is me. I met Milo this morning when she came into my apartment on a cat leash. Well actually she has no idea how to walk on a leash, and probably never will. Milo has a mind of her own. I have given her the empty office room so there isn’t anything for her to tear up, shred, or otherwise destroy during the off times that I can’t be here to watch her. I don’t have any idea how to take care of a cat. I got her food and water and a saucer of milk (I hear cats like that), and she has a bed and litter box. She is scared to death of everything in my apartment, but I think she will adjust quickly. She has snooping around the living room and kitchen, and in the last hour has gone from hiding under the furniture to running circles around the room, jumping from thing to thing. That’s when I heard a loud crash. 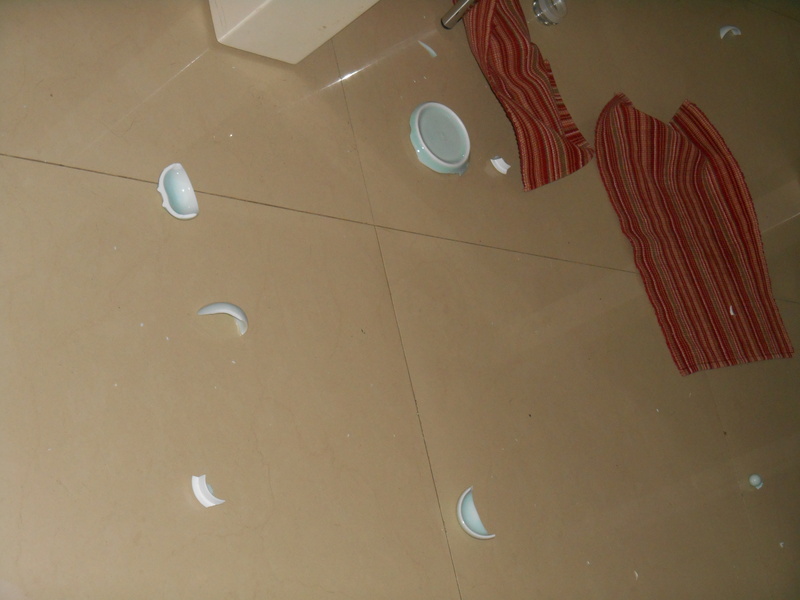 My brand new tea set from a street vendor in Jinhua is gone. It was my favorite color blue, as you can see here, but my tile floor is really unforgiving when you drop something on it. It’s hard to be mad though, because I know Milo wasn’t trying to break my things, she was just trying to find a good hiding place because she was scared. It’s hard to be mad at that. I’m crossing my fingers that the next few days go better and Milo adjusts to being in a new place by not wrecking my furniture. Wish me luck. Milo sounds like a lot of work! But I think you enjoy having a cat. You will have someone to share your day with and talk to. I have always liked cats. I meant to tell you in my last email that George read your entire letter LAST week in class. We all enjoyed it. We always keep you in our thoughts. Tonight, George even mentioned that you had a cat! P.S. I like you alligator slippers! I’m glad my letter came through. I know it was a long one but hopefully it will help everyone back home feel like they are here with me. There’s a lot of good work going on here. Michah was over training the cat yesterday and I was talking to him about whether or not us being here is making a difference. I get discouraged sometimes, but I think maybe he’s right. You don’t always know how much good you are doing, and sometimes things take a while to “cook”, some plant, others water and Dad gives the increase. I guess that’s what I’ve got to keep in mind… I may never see the end result of seeds I plant, but that doesn’t mean the planting isnt important. How fun. I’ve never had a cat before, so I’m not exactly sure what to expect. My friend Michah says I’ll have to play with her for like 45 minutes a day to get her to settle to the point that she’s not running circles around the house all the time. She’s a kitten still so she’s got ALOT of energy. LOL. Thanks Elly. She’s a real sweetie. My friends Kristen and Michah are helping me train her… I don’t really know how to train a cat. The kitten has been great so far. If I can just keep her from scratching up the furniture I will be happy.